Dining options at the hotel include a restaurant and a coffee shop/café. A bar/lounge is on site where guests can unwind with a drink. A computer station is located on site and wireless Internet access is complimentary. This business-friendly hotel also offers tour/ticket assistance, dry cleaning/laundry services, and express check-in. 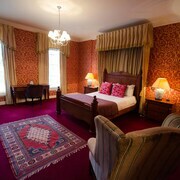 The Crescent Townhouse Hotel is a smoke-free property. Located in Belfast City Centre, this hotel is within a 10-minute walk of Queens Film Theatre and Queen's University of Belfast. Grand Opera House and Belfast Botanic Gardens are also within 15 minutes. Belfast Central Station is 21 minutes by foot. A restaurant, a bar/lounge, and a coffee shop/café are available at this smoke-free hotel. WiFi in public areas is free. Additionally, dry cleaning, a computer station, and express check-in are onsite. All 17 rooms offer free WiFi, coffee makers, and flat-screen TVs with cable channels. Free bottled water, hair dryers, and safes are among the other amenities that guests will find. The Crescent Townhouse Hotel offers 17 accommodations with safes and complimentary bottled water. Flat-screen televisions come with cable channels. Bathrooms include complimentary toiletries and hair dryers. Guests can surf the web using the complimentary wireless Internet access. Housekeeping is offered daily and irons/ironing boards can be requested. Town Square Restaurant - Onsite restaurant.